Dennis H. Chookaszian, former chairman and CEO of CNA Insurance Companies and a Northwestern University alumnus, and his wife, Karen, have made a $6.5 million gift commitment to his alma mater to establish the Chookaszian Family Program in Computer Science, the first of its kind at the University. Fueled by the prevalence of technology in society, the demand for computer science courses has exploded at Northwestern and across the country. The number of computer science majors at Northwestern has more than tripled in the past five years, and students from across the University are taking numerous computer science courses. The Chookaszian Family Program will support initiatives to grow and strengthen the computer science program at the McCormick School of Engineering and Applied Science and help provide courses to all interested undergraduate students. The Chookaszian gift is the latest in a series of gifts supporting computer science and positioning Northwestern as a leader in the field. Two of the program’s priorities reflect areas of interest for the Chookaszians: increasing the numbers of female computer science majors and expanding faculty teaching and research in “learning sciences,” a field at the intersection of computer science and education. The Chookaszian Family Program in Computer Science, which will formally launch next fall, will help Northwestern students take advantage of new opportunities presented by technological innovation. The flexible design of the program ensures that it will stay relevant in a world where the pace of technological change is accelerating. The Chookaszians’ gift, which includes a bequest, will count toward We Will. The Campaign for Northwestern, a $3.75 billion University-wide fundraising effort announced in 2014. With this new gift, the campaign now has raised nearly $16 million for computer science at Northwestern. This support is helping to drive growth and progress in a critical area. Since fall 2014, nine new faculty members, including two teaching-focused faculty, have joined the department of electrical engineering and computer science. In order to accommodate as many students as possible, many core computer science courses have been reinvented. For example, a newly revamped introductory course, CS111 Fundamentals of Computer Programming, opened this fall to more than 340 students and will be offered for additional quarters this year. 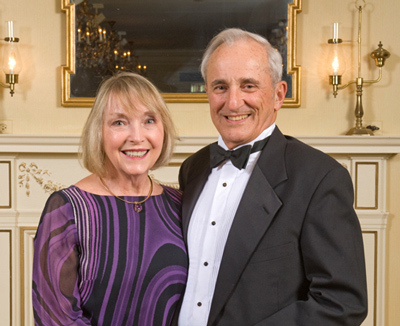 Dennis and Karen Chookaszian have given to several areas of the University, including McCormick and the Kellogg School of Management, and are gold-level members of NU Loyal, a giving society recognizing those who make a gift to Northwestern every year. They earlier established the Chookaszian Computer Science Fund for development of a stronger computer science program at Northwestern, and their new gift will expand on this. In 2001, the Chookaszians established the Chookaszian Prize in Risk Management at Kellogg. Dennis Chookaszian, who focused on risk management for most of his career, wanted to raise its profile in the academic world. The prize is given annually to a Kellogg faculty member for innovative research in risk management. Dennis Chookaszian held several executive roles during his 26-year tenure at CNA, including serving as chief financial officer, chairman and CEO and chairman of its executive committee. He was named the Financial Times’ Outstanding Director in 2010. He also served for five years as chairman of the Financial Accounting Standards Advisory Council. Since retiring he has served as a corporate director, and he has been on the boards of 12 public companies and a number of private companies and nonprofits. Dennis Chookaszian serves as a Life Trustee at Northwestern and is a member of the Dean’s Advisory Board at Kellogg, the McCormick Advisory Council and the Northwestern Memorial Foundation’s board of directors. In 2014, he received the Alumni Medal, the highest distinction awarded by the Northwestern Alumni Association to alumni. He is co-chair of his 50th Reunion, and both Dennis and Karen Chookaszian serve as co-chairs of the campaign committee for McCormick. Dennis Chookaszian also is a member of the national board of the Boy Scouts of America and president of the Foundation for Health Enhancement. He is a member of the directors’ table of Beta Gamma Sigma, an honorary fraternity. The Chookaszians have three children and nine grandchildren. Their son, Michael, and son-in-law, Zach, received their MBAs from Kellogg. The funds raised through the “We Will” Campaign will help realize the transformational vision set forth in Northwestern’s strategic plan and solidify the University’s position among the world’s leading research universities. More information on We Will. The Campaign for Northwestern is available online.